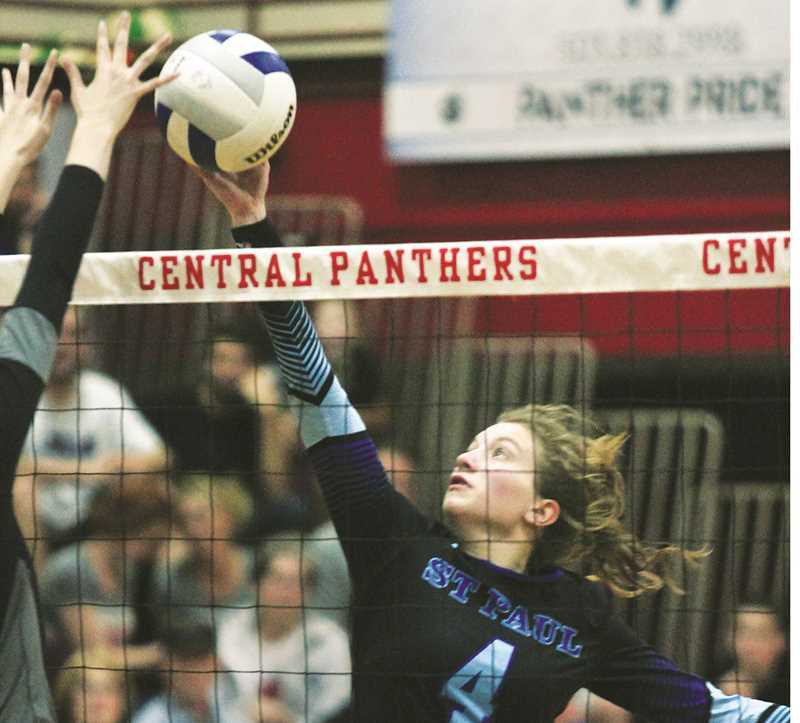 INDEPENDENCE -- The St. Paul volleyball team put the finishing touches on a flawless regular season, winning the top seed from the Casco League with a three-set victory over Perrydale Saturday in the championship game of the league tournament at Central High School. It was the third win of the season over the Pirates, capping an impressive unbeaten run for the No. 1 Bucks (26-0, 14-0 Casco League) through its league schedule in which St. Paul never lost a set. "I'm overwhelmed right now," SPHS junior Isabelle Wyss said. "It's a lot." Although St. Paul was the heavy favorite to win the tournament championship game and claim the Casco League's top seed going into the state playoffs this week, the Bucks were careful not to underestimate a Perrydale team that was formidable in its own right, owning a 24-6 overall record while going 11-3 in league to earn the No. 5 ranking in the state. Both teams were assured a playoff spot by virtue of playing in the league title game, but bragging rights, a perfect record and an easier road to the quarterfinal tournament was all the incentive the Bucks needed to come to the court with their A-game. "We definitely didn't want to think that we were going to win, because you never know what can happen," Wyss said. "We needed to play our game no matter what. Of course we want to be the highest seed possible." Both teams started strong, trading points for the first rotation of the opening set. But the Pirates couldn't keep pace for long and St. Paul junior Karlee Southerland broke a 7-7 tie through strong service that led to three straight points to allow the Bucks to pull away. Junior Erin Counts served for four more points and Jordan Caldwell served six in a row, allowing the Bucks to outscore Perrydale 18-7 to take the first set 25-14. From there, the St. Paul machine couldn't be stopped. The Bucks opened the second set with seven straight points with Southerland serving before Caldwell went on a 12-point run that put St. Paul ahead 22-6 and the Bucks coasted to a 25-11 win. The third set went much the same (25-13) and the Bucks left the court victors, with a subdued celebration, knowing that the true test in the crucible of the state playoffs is on the horizon. "We're going to keep fighting and just play our game" Wyss said, thinking ahead to the team's upcoming second round home game on Saturday. "Never underestimate a team and always expect them to come fighting." It was a strong team effort all around on the stat sheet. Wyss led the team with 14 kills, followed by 10 more from Counts. Caldwell and Southerland did well setting up points, combining for 31 assists. Caldwell added 10 aces on service as well. Defensively, Counts led the team with 12 blocks and Sadie Smith had five more. Emma Connor had 15 digs that led to kills. The Bucks now await the results of the first round of the state playoffs Wednesday; they will host the lowest-ranked of the eight victors. In the meantime, St. Paul will bide its time and continue to finely tune its game this week, as the Bucks have done every day between games this season. "It's crazy," Wyss said. "The improvement from the beginning of the year you might not have been able to see unless you're on the team. We've all improved." As a result of their continued dedication, the Bucks earned plenty of accolades following the result of Saturday's tournament finale. Wyss, Counts and Caldwell were each named to the all-tournament team, and Wyss was unanimously picked by Casco League coaches as League Player of the Year, an honor that she largely contributed to the quality of her teammates. "It's my teammates a lot too, it's not just me," she said. "My diggers, my setters. I've seen many, many setters and I have not seen setters better than my setters. Our passers, we do not let the ball hit the ground. We make sure we're always moving, always on our toes ready for everything." Coaches echoed her sentiments in their all-league votes, naming teammates Counts and Connor to the first team with Wyss. Southerland and Caldwell represented St. Paul on the second team, and Mercedes Smith rounded out the awards by earning an honorable mention nod. Together, the team has one singular goal to finish the year. Four more wins would bring a state championship to St. Paul, something the friends and teammates on the Bucks have worked hard to achieve, not just this year, but many seasons going back before high school. "We've all grown up together and been with each other as long as I can remember. You can start to see it in games, everyone clicks so nicely," Wyss said. "This is the year we've been waiting for a long time."